Names. Companies. How long is a piece of string. Three members of Dunedin’s Sievwright real estate family and employer Edinburgh Realty have been censured and collectively fined more than $17,000 for “unsatisfactory conduct” by the Real Estate Agents Authority (REAA). The decision, published last week, is under appeal by the Sievwrights and Edinburgh. Barclay Sievwright and sons Lane and Clayton were censured for “unsatisfactory conduct” and fined $3750. Edinburgh Realty was similarly censured and fined $6000. Another real estate agent, Matthew Shepherd, was censured. Dunedin real estate agent Tim Barnett has been censured and fined by the Real Estate Agents Authority (REAA) – a decision which is under appeal – over commission on a more than $700,000 commercial building. The decision, released last week, found “unsatisfactory conduct” against Mr Barnett. He was fined $2000 and required to undergo further training. Mr Barnett, of Tim Barnett Realty, declined to comment when contacted because the decision was under appeal. Paul Hudson (65), of Port Chalmers, said that he was “humbled and honoured” for the recognition of his involved with commerce, local government and the community in Dunedin for 50 years. He worked for Cadbury Fry Hudson between 1973 and 1996 and, as managing director, led Cadbury’s transition to conducting its worldwide business from centralised locations. The service to the community included work for Port Chalmers Kindergarten, the Aramoana Trust, Regent Theatre, the Otago Arts Society, the Dunedin Council of Social Services and the Dunedin Community House Trust. “My involvement with the establishment of Community House, my early years in Save the Children Fund and various roles and involvement in local government have been very satisfying,” he said. 16.9.11 DCHL and subsidiaries: shuffling, no real clean out? 7.7.10 DCC, DCHL, CST, DVML, DVL? Cr Lee Vandervis questioned whether stadium events delivered additional economic benefits or largely moved money around within Dunedin. [DVML chief executive] Darren Burden disputed the latter, citing an economic impact report on Sir Elton John’s stadium concert, estimated to have contributed $14 million to the city’s economy. The exact figure could be disputed, but with half the 35,000-strong crowd for the show coming into Dunedin from elsewhere, returns for the city were ”in that sort of ballpark”, he said. Cr Syd Brown hoped the ”modest” extra investment would allow the stadium, and the city, to ”punch above our weight”. Other councillors also supported the move, including deputy mayor Chris Staynes, who said even if the economic impact of shows like Sir Elton’s was only half what was claimed, it was still ”a pretty good investment”. The Dunedin City Council has voted to accept radical recommendations in a confidential report that slams governance of its holdings company. Mayor Dave Cull last night said the council was seeking legal and accounting advice on how it could implement the measures suggested by the report’s author, governance and business leader Warren Larsen. 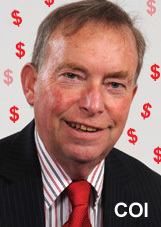 Mr Larsen suggests a radical overhaul of governance of the council-owned holdings company Dunedin City Holdings Ltd and a review of the “fit” of its subsidiary companies to council requirements. The Dunedin City Holdings board should be “entirely reconstituted”, it said, recommending three externally sourced directors for an initial three-year term. All should be independent and drawn from a New Zealand-wide recruitment search, initially beyond the Otago region. Ideally, there should be an increase in the pool of women directors and “younger, high-potential, competent directors”.